Although recordings of individual G&S excerpts were made as early as 1898, this 1906 Mikado is the first compilation that qualifies as something like a complete opera. The occasion for this milestone was a new repertory season at the Savoy directed by W. S. Gilbert himself, in the Company's first London appearance in several years. Naturally, interest in the operas was at a peak, and G&T meant to capitalize on it. One look at the cast list, however, shows that there is much to be desired in this early effort. The singers, dubbed the "Sullivan Operatic Party" (S.O.P.) or "Sullivan Quartette" (S.Q.) for marketing purposes, were studio artists chosen because their voices "recorded well," not because they had any association with the Gilbert and Sullivan Operas. Numbers from the opera were recorded on an ad-hoc basis with whoever happened to be available for a particular recording session, hence the overlapping role assignments. The singers may not even have known their parts in advance. Notwithstanding these reservations, G&T clearly was concerned about quality. Denise Orme was given no fewer than four chances to record "The sun whose rays," on two separate occasions. Evidently none of them was satisfactory, and a final session was scheduled for Eleanor Jones-Hudson, and it was her recording of the song that was issued. Similarly, two takes of "Were you not to Ko-Ko plighted" featuring Orme and Ernest Pike were rejected, and the duet re-recorded with Jones-Hudson and Pike. The one Savoyard in the cast was Amy Augarde (1868–1959), who joined the D'Oyly Carte Opera Company as a chorister in 1884, played Mad Margaret for a time in the original production of Ruddigore when Jessie Bond was ill, and understudied Hebe in the 1888 revival of Pinafore. While her stage appearances were in soubrette roles, her G&S recordings were in contralto parts. The opera was recorded on one 12-inch and sixteen 10-inch single-sided discs, which were designed to be purchased individually. (The 12-inch side was "A wandering minstrel.") 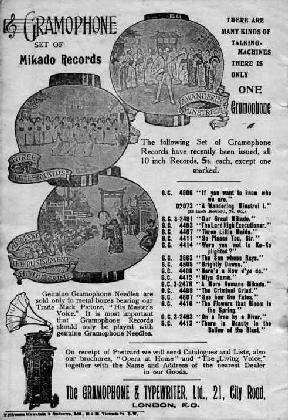 In December, 1906, the full set was then issued with a descriptive booklet. It cost 65 shillings. Later, the complete set was re-issued by HMV on double-sided discs. The has not been re-issued on LP or CD. Rees and Wolfson both disagree with Francis on the number of sides, with Francis listing five fewer than the others do. Francis omits sides 1, 2, 4 9, and 14. Francis also misstates the matrix number of s. 16 (misprinting 8955½b as 89551/2b). Bennett lists John Harrison on s. 2 (agreeing with Rees and Wolfson), but he gives the recording date as November 1906. Wolfson lists two sides, presumably of "Alone and Yet Alive," recorded on 28 August 1906 by Amy Augarde but never issued. These bear the matrix numbers 8789b and 8790b, which would fit them into this set. See the Recording Sessions, below. In the table above, matrix numbers in italics indicate unissued takes. Where the entire row is in italics, it indicates multiple takes on the same recording date, none of which were issued. Sources are Rees, Wolfson, and Alan Kelly’s magnificent presentation of all matrix numbers having the b- suffix between 1901 and 1919 as transcribed by Howard Friedman. Per Friedman, matrices 8979–80 were recorded on 16 September. Per Rees, they were recorded on 18 September. Per Friedman, unissued matrix 733c was recorded on 29 or 30 August.